(Greg) Totally relaxed and still laughing about our experience at the bath, we boarded our midnight bus to Ephesus. Matt, who sat in the back of the bus, said he had a miserable time that night, but Chris and I, who sat toward the front of the bus, snuggled up and had a decent sleep. 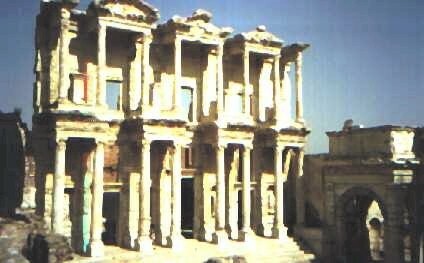 the bus arrived about 7:30am and we arranged storage for our bags and transportation to the ruins of Ancient Ephesus. The ruins of Ephesus were by far the most spectacular ruins we had seen, mainly because they were the least ruinous of all the ruins we had seen. The Greeks built the city in a cool spot on the mountain side near the water which made for a great port. the city reached its height shortly after the time of Christ with a population of 250,000, making it the 2nd largest city in the Roman Empire (after Alexandria.) It was a thriving port city, but, unfortunately, the water had different ideas. Slowly, over time, the water receded like Sam's hairline. 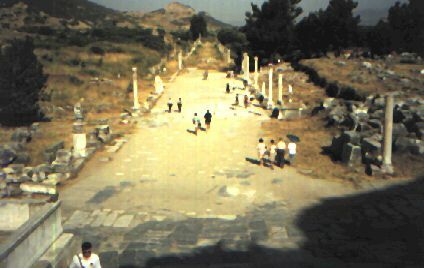 The people of Ephesus extended the road to the port, but the water kept receding until, like Sam's hairline, it was 9 km from its original spot. This didn't discourage the city until a malaria epidemic cause by mosquitoes breeding in the swampy old harbor killed 200,000 people in the 7th century. After that, the city was deserted. On entering the main gate, we were immediately drawn to a well preserved theater in the center of town. Across the street was a beautiful library where we rested and Dave checked out a few books. The main attraction for most of the tourists seemed to be the ancient brothel. We said "hi" to the women, but continued up the hillside to the upper city. There we discovered we had missed the church of the Virgin Mary where the Council of Ephesus stated Mary is the Mother of God in 429 AD. So we trudged back down the hill and marveled at those ruins for a bit. Then back up the hill we climbed to meet our driver as we had arranged. 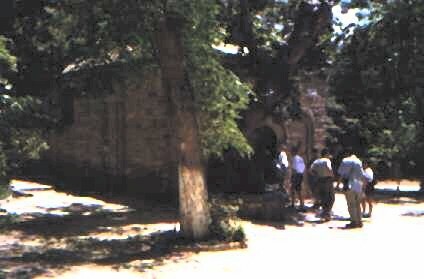 Chris, however, decided to stay and see the house of the Virgin Mary. the rest of us went back to town and sat in a Turkish rug shop enjoying the A/C and sipping tea. We successfully resisted the dealers sales pitch and found a ride to the house of the BVM, hoping Chris was there waiting for us. He wasn't, but the house was nice anyway. On the site there was a little chapel where we prayed awhile. Back in town, we found Chris waiting for us. he hadn't made the 11km climb to the house of BVM and found a ride back to town with a rug dealer. Before catching our ferry to Samos, we made a quick stop at the church of St. John. 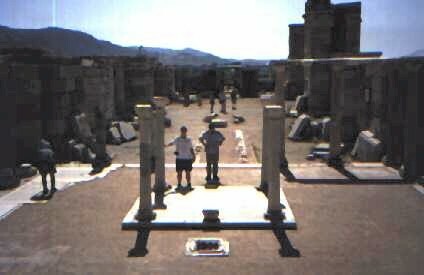 It was huge in its time, but now consisted of a few broken walls and columns. The prime attraction was the spot reputed to be St. John's grave. The ferry to Samos was uneventful. Most of us slept on hard benches for the 1 1/2 hour trip. After arriving in Samos and going through the most thorough customs search in our trip (the guy must have been new), we found a REALLY nice hotel. Chris gave the hotel lady his passport (foreshadowing) and we headed off for the local beach. It was one of those rocky beaches and the water was nice and cool and had a clear blue tone to it. Chris, Matt, and Greg swam out a ways to see the sunset (they had to tread water for at least a half-hour.) Meanwhile, Sam is treading water closer to shore (he totally missed the sunset) and Joe and I watch the sunset from above atop a small cliff. After our swim and some nice cold drinks, we settled down to a long summer's nap.